Greens Farms resident and Representative Town Meeting member Greg Kraut spoke in opposition to a new home construction at 20 Morningside Drive South at the Historic District Commission meeting on Dec. 12. 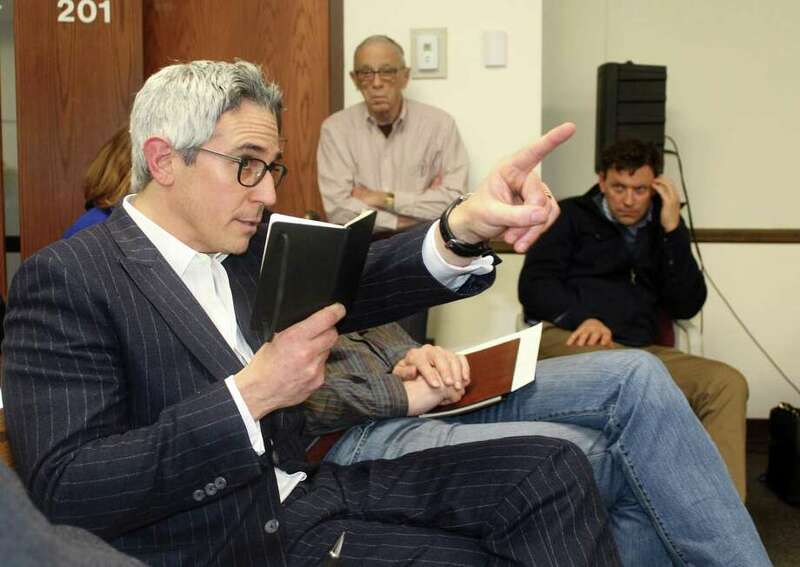 WESTPORT — It’s not every day an average resident writes, on his own accord, a detailed “three-year emergency recovery plan” for the state, but Westport resident and newly elected Greens Farms Representative Town Meeting member Greg Kraut has done just that. Kraut’s soon-to-be-released magnum opus for Connecticut’s economic future includes three recovery phases and more than 15 policy ideas, from doubling the state’s gaming revenue, with proceeds going to a separate education fund, to limited and controlled privatization of the state’s transportation infrastructure, lottery and beaches. “When you ask me what got me involved in all this, it’s a clear vision for repairing Connecticut and how you get Connecticut back on track and make it very competitive in the tri-state,” Kraut said. Kraut has devised a Westport-specific economic recovery plan, as well. The plan proposes a 3 percent cap on commercial property tax increases to provide businesses interested in relocating to Westport the certainty Kraut said is absent from state economic policies. Growth and maintenance of the town’s commercial base, which accounts for 15 percent of town property — double that of peer towns, will prevent future residential property tax spikes and further entice new residents to town, Kraut said. Coupled with the 3 percent cap on property tax increases, Kraut said his plan would give new businesses rent credits on condition owners improve their buildings, volunteer in the community and commit to staying in town. “We could really start bringing in some of those really tony millennial firms into the smaller suburban office buildings here,” many of which are currently vacant, Kraut said. Kraut’s crusade to fix the state began in 2016, when he moved to town with his wife, Haley Kraut, and the couple’s two young sons. Previously, the Krauts lived in Scarsdale, N.Y., for five years and Greenwich for two years before that, but moved to Westport, attracted to the nice people, lower taxes, beach access and a large home in Greens Farms. During the state budget crisis last year, Kraut said he grew concerned, especially about maintaining the school budget, and began to look through the state’s financial books and formulate a plan. Thoroughly researched, Kraut’s plans include data on the potential revenue generation of each of his proposed policies, and when speaking about his ideas, he often recalls specific revenue numbers and policy details from memory. “I’ve consulted with everyone from Kudlow (Kudlow & Co.) to the Tax Foundation to the Buckeye Institute because I find it interesting what you could do and how you could do it,” Kraut said. When Kraut moved to town, he met another Greens Farms resident, John Suggs, a longtime Representative Town Meeting member, who ran as an independent candidate for first selectman last year. Kraut said Suggs listened to his interest in policy issues and encouraged him to run for the RTM. “The more I looked into it, the more I started getting energized about it and saw people receptive to my thoughts and ideas,” Kraut, a registered independent, said. He decided to run for the RTM and said throughout the course of the election he spoke with over 300 residents in his district and maintained an extremely active Facebook page. In November, Kraut won a spot on the RTM with more votes than any other RTM candidate in his district. Although the RTM position is Kraut’s first elected office, he grew up in a political family with a conservative Democrat father and moderate Republican mother who ran for office as the first woman to do so in his hometown of Roseland, N.J. Throughout his 20-year career in real estate management and development, Kraut, who last year opened his own firm, was named one of Commercial Observer’s Power 100 in New York City real estate for three consecutive years and helped devise the commercial revitalization program in Lower Manhattan that informs many of his ideas for improving Westport’s commercial vibrancy. Outside of work, Kraut is an active volunteer on many Jewish and mentorship-oriented organizations and said he tries as hard as possible to be there for his young sons as a coach and engaged father. Although Kraut frequently begins sentences with the phrase, “if I were governor,” and has a clear policy vision for the state, he said he’s not interested in higher office. “I don’t have any delusions of grandeur. I don’t want to be the president of the United States. I don’t want to be a congressperson. I just want to help the town, help my district, and whatever I can do for the next governor to help the state turn around,” Kraut said.